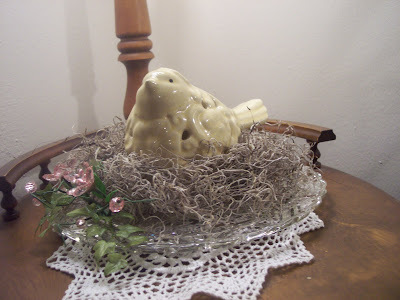 The Thrifty Groove: Table Top Tuesday ~ Just a little Spring! 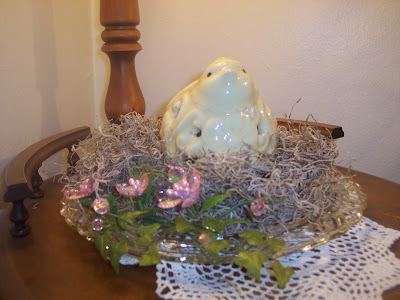 Table Top Tuesday ~ Just a little Spring! Do you want to take a look at a lovely home? 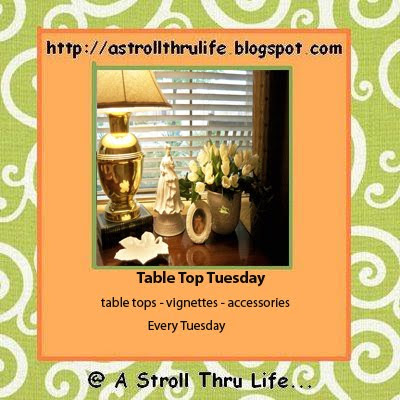 Well, head over to Marty's blog, "A Stroll Thru Life" and check out today's Table Top Tuesday. Oh so beautiful!! Marty has just such an inviting home and everything is so pretty! While you are there, check out other folks linking up. Since this is just a quick, put it together yourself, little vignette, I thought I would add it to a couple of wonderful blogs. I always like to find quick, easy and thrifty D.I.Y. ideas. 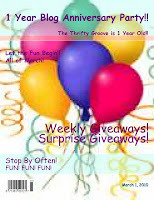 so, check out these fun blogs! The little table top I am showing is a floor lamp table. It was a thrift find and needs a little TLC but, that will have to wait until warmer weather. This table sits in the corner of the living room. I just wanted something simple but, Spring-like. 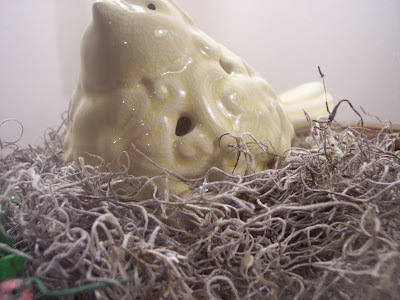 I used one of my cut glass cake plates and added a bunch of Spanish moss to create a nest. Then I tucked a new flower pick in the side. 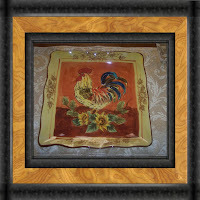 The pick is from the new spring garden accent line at Michael's. The flowers are glass as well as some of the leaves and a few little beads. 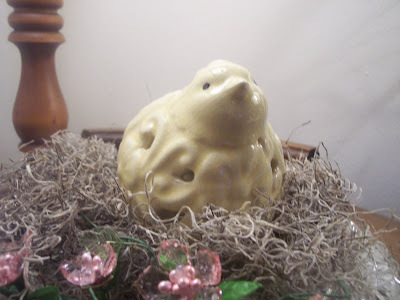 Then I placed the cute crackled-look creamy yellow chicken on the nest. This chicken is also part of the same line as the flowers. I love all the pretty things from this grouping. I picked up a few other items while I was there today. And the best part, this whole line is 50% off right now! I want to find a pretty soft yellow napkin to put under it. Love that little bird. Saw them at Michael's and the whole line is wonderful. I am ready to get some Spring in my home!! Diann, you just made me add Michael's to my list of errands today! Too cute! Oh look at that sweet little bird looking up at us. Too Cute! 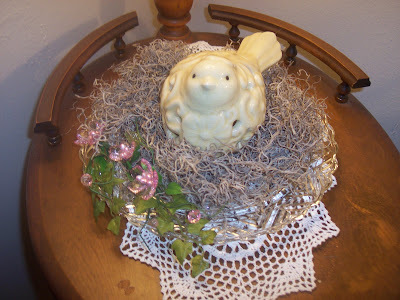 Such a sweet little chicken, already nesting :-) Come on Spring! Oh, that little bird is so precious! Love your vignette. What a cute little nest you've made. 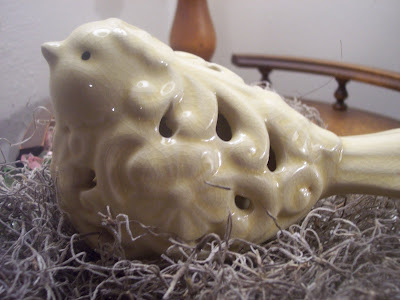 Perfect for a springtime birdie! I love that bird! I need to get my fanny to Michael's! I love the bird also. Just so precious. I love your idea.. It looks amazing.. 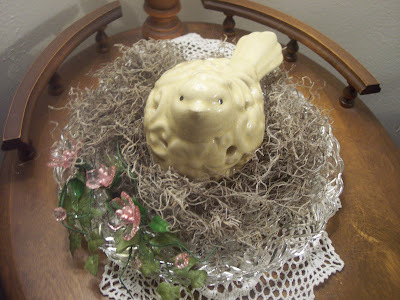 I never get tired of birds and nests do you? Congratulations on your blog anniversary too! I have been blogging about a year also...fun times...thanks for stopping by and for your comment. very sweet! I love the little details on the bird! Oh, I love little birds--so sweet. Thanks for linking up!